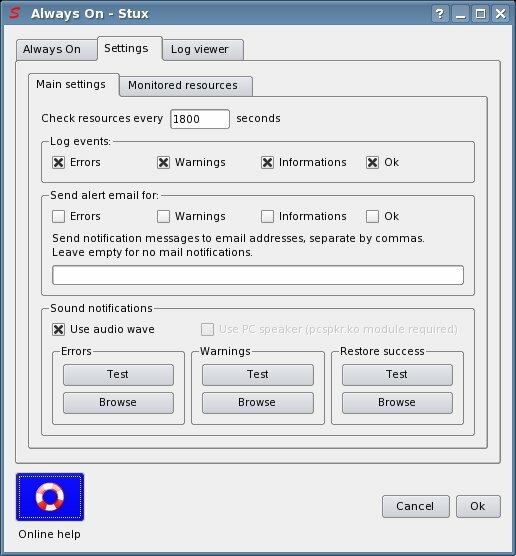 'Always On' is a daemon, designed for STUX GNU/Linux, that monitors network settings and services. status of connections (ppp0, wlan0, eth0, ...) configured in STUX Network Panel. network services managed with STUX services manager. This tool is specifically designed for hosts running services on unreliable connections (ADSL, wlan/wi-fi, dialup but also for ethernet) and guarantees a better service continuity and availability. Resources will be monitored at a specified interval of time: if a service or connection is found unavailable, it is automatically restarted and alarms are sent. To start/stop Always On, use STUX services manager, right click on 'ALWAYS ON' and choose Start/Stop/Restart from pop up menu. Open STUX services manager and right click on 'ALWAYS ON'. Choose 'Configure' from pop up menu. If the Always On daemon is running, changes are considered on next check (no restart is required). Here are listed all connections created with STUX Network Panel that has been marked as 'Always On'. You can enable/disable Always On for the listed connections clicking with the right mouse button on the name of the connection. Here you can specify an Internet host to test Internet reachability and you can specify the Internet connection to restore in case of test failure. Target host must accept ping requests. Please use a target host that you are authorized to ping. Here are listed all services created with STUX services manager that has been marked as 'Always On'. You can enable/disable Always On for the listed services clicking with the right mouse button on the name of the service. Here you can choose if check or not the default network route interface and the default gateway. Here you can choose if check or not the DynDNS registration and is also possible to configure that setting. Here you can choose if set or not date and time syncronizing with a time server. Always On logs in file /var/log/syslog.